Welcome to Magical Moments Fine Art. My chosen subjects are inspired by the forests, vegetation, lakes, creeks, hills and skies around my home in Northern California. My originals are rendered with great care in pastels. In these landscapes and skyscapes, I am painting my response to sunlight as it bathed a hillside at day’s end, lit up a tree from behind in the morning, or transformed the clouds in the sky into a panorama of glorious colors. These are the magical moments I live for, the moments that excite my passion and inspire my soul. 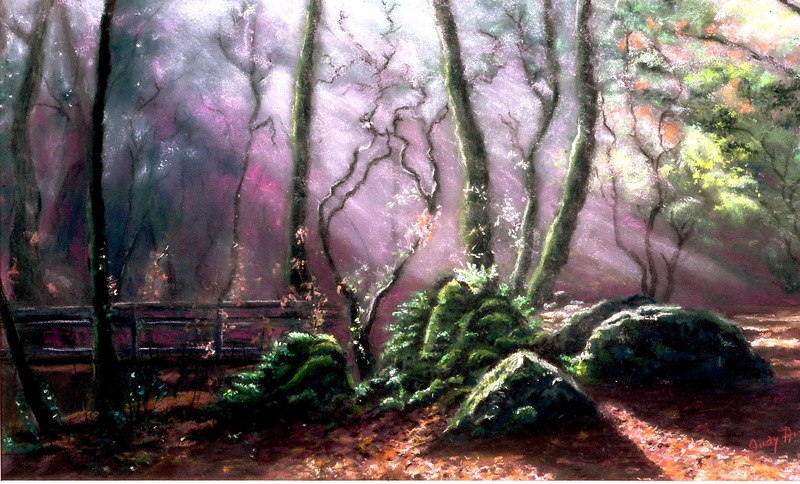 The phrase,”Magical Moments” describes what it is like for me to create each painting. Every moment spent painting is magical. Anxiety, worry, regrets disappear as I apply colors to paper. All I’m aware of is a kind of peaceful excitement - and love. I hope that in viewing these creations, you will experience some Magical Moments of your own. To view my gallery of images and see the other page options, go to the top right corner of this page where you will see a series of three horizontal bars, one under the other. Hover you mouse over that, and the options will appear. Then click on the one you want.